Welcome to the Big Bend National Park Information Guide. Big Bend National Park is located in Southwestern Texas in Brewster County . In 1933, the state of Texas established Texas Canyons State Park, using 15 school sections owned by the state. Lands forfeited for non payment of taxes were quickly added and the name was changed. By October 27, 1933, Big Bend State Park included about 160,000 acres. In 1935, on June 20, President Franklin D. Roosevelt signed a bill that authorized the establishment of Big Bend National Park. On June 6, 1944 a deed for about 700,000 acres was formally presented to President Roosevelt and Big Bend was established June 12, 1944 as a National Park by Congressional Act signed by President Franklin D. Roosevelt. It was designated an International Biosphere Reserve in 1976. Big Bend National Park is a land of borders. Situated on the boundary with Mexico along the Rio Grande, it is a place where countries and cultures meet. It is also a place that merges natural environments, from desert to mountains. It is a place where south meets north and east meets west, creating a great diversity of plants and animals. The park covers over 801,000 acres of west Texas. 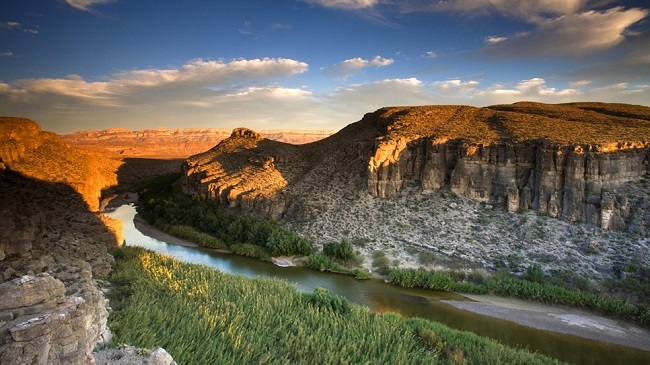 For more than 1,000 miles, the Rio Grande forms the international boundary between Mexico and the United States; Big Bend National Park administers approximately one-quarter of that boundary. Within the 118 twisting miles that also define the park’s southern boundary, the river’s southeasterly flow changes abruptly to the northeast and forms the big bend of the Rio Grande. Big Bend National Park is open year round. But the majority of park visitors come March and holiday weekends, lowest visitation is in August and September. The park is open 24 hours a day, seven days per week. With an average of 350,000 or less visitors a year, Big Bend National Park is lightly visited, however for those that do, they find, clean air and plenty of sunshine, as well as many opportunities to hike and enjoy the outdoors. The Indians said that after making the Earth, the Great Spirit simply dumped all the leftover rocks on the Big Bend. Spanish explorers, less intimate with the landscape, merely dubbed this “the uninhabited land.” To come to know this land of desert and mountains cut through by the Rio Grande, the big river, is but to grasp a larger appreciation of the unknown. Prehistoric Native Americans made their homes here at least 10,000 years ago and perhaps earlier, but little evidence of human occupation appears until the Archaic or Desert Culture of 6,000 BC. These people were not farmers but hunters and gathers who took only what this country offered on its own. The name Big Bend refers to the great U-turn the Rio Grande makes here in Southwest Texas. The river is an arching linear oasis, a ribbon of green strung across the dry desert and cutting through its mountains. As do all rivers that survive desert passages, the Rio Grande has its headwaters outside this desert. Today, much of the water flowing through the park is supplied by the Rio Conchos, flowing out of Mexico, and not by the Rio Grande. Much of the flow of the Rio Grande is diverted for irrigation or lost to evaporation before reaching the park’s western boundary. The Rio Grande defines the park’s southern boundary for 118 miles. The garfish and some turtles in the river are living fossils that help describe its former life as a lush savannah and swamp 50 million years ago. Their ancestors swam in company with crocodiles and hippopotamus-like creatures. North America has four warm deserts: Great Basin, Mojave, Sonoran and Chihuahuan. The Chihuahuan extends deep into Mexico. Big Bend National Park lies in the northern third of the Chihuahuan Desert. This desert is bordered on three sides by mountains that block the rains. The fourth side abuts vast semiarid plains. The Chihuahuan Desert is young, perhaps not more than 8,000 years old. It is also a green and somewhat lush desert that receives most of its rainfall during the summer months when it is needed most. The chief indicator plant of the Chihuahuan Desert is lechuguilla, appearing as a clump of dagger blades protruding from the desert floor. The coarse, strong fibers of the lechuguilla are used in matting, ropes, bags and household items, which are, in a way, products of the Chihuahuan Desert. The lechuguilla illustrates an often misunderstood fact about the desert: the desert is a life zone. Life has adapted here to minimize expending its energy and to maximize getting or even hoarding water, as the kangaroo rat illustrates. If the Rio Grande interrupts the Big Bend country as a linear oasis, the Chisos Mountains interrupt it as a green island in a desert sea. As does the river, the mountains bring creatures you might not expect to find in desert areas, and several species are quite rare. Isolation provided the key. This situation was set in motion thousands of years ago as the Great Ice Age drew to a close. As the colder, moister climates retreated northward, many plants and animals became stranded in the Chisos Mountains by the lowlands’ increasing aridity. Obtain a backcountry permit for any overnight use. Building ground fires is prohibited. Fire danger in Chisos Mountains may be extreme. Pets are prohibited on park trails and in the backcountry. Besides highcountry trails, there are numerous rewarding hikes in the lower desert region, ask a ranger about them. Be wary of high water and low spots when camping. Do not camp in arroyos or washes, they may become raging rivers while you sleep. The best season to bicycle in the park is between October and April, when daytime temperatures are pleasant and evenings are cool. Observe posted speed limits. The maximum speed limit in Big Bend is 45 mph. If water crossings are flooded by seasonal storms, wait out the high water. A few minutes wait is better than having your vehicle swept downstream and endangering your life and those with you. No vehicles may be driven off established roads. Backcountry roads are subject to closure from storm damage. Check on road conditions before driving unpaved routes. Watch for wildlife at night. Animals blinded by your headlights may stay on the road. Fishing licenses are not required within the park. Park rangers can supply fishing information. The only restaurant in the park, is Chisos Mountain Lodge. There are also limited groceries, cold drinks, film and camping supplies at Basin, Castolon, Panther Junction and Rio Grande Village. In the Big Bend Visitor Centers, you may buy film, maps, as well as other informational materials. You can always bring your own food or there are restaurants in the local communities listed above. Pets must be leashed at all times and are prohibited on trails, in the backcountry, in public buildings, on the Rio Grande or anywhere off established roadways. There are no kennels in the park, one is open seasonally outside the park. Pets may not be left unattended in the campground or in vehicles. Consider your plans very carefully before you bring your pet with you. Visitor centers are located at: Castolon, Chisos Basin, Panther Junction, Persimmon Gap and Rio Grande Village. Chisos Basin and Panther Junction are open year round. Carrying drinking water in desert country. Hikers require one gallon per day per person. Start your return trip before half your water is gone. Treat spring water before drinking and don’t drink the river water. Annual precipitation is just under 10 inches in most of the park, but in wet years may exceed 30 inches in the mountains. Typically, winter and spring are dry seasons; the rains usually begin in June and last into the fall. Summer brings hot days and warm nights. Dramatic afternoon lighting storms with high winds are common and come on quickly. Heavy downpours may result in flash floods. Winter days may be sunny and warm, but nights tend to be cold. Winter storms can blow in suddenly with plummeting temperatures and rain or snow. The weather in Big Bend – hot or cold – injures and kills more hikers than any other factor. Come well prepared because weather changes can be dramatic and unexpected.